Hello! We’re thankful for all the support you have shown Akshaya Patra! We’re going from strength-to-strength, thanks to your firm backing. In 2017, we expanded our reach to the northeastern state of Tripura and also added to our reach in Gujarat with a kitchen at Bhavnagar. This is our fourth centralised kitchen in the state, feeding 28,000 children in 57 schools. 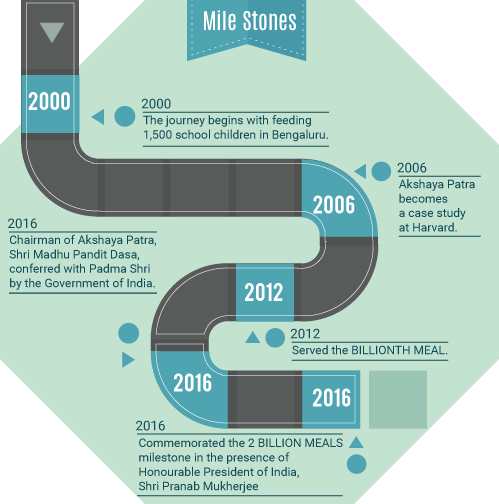 To take our mission of feeding 5 million children by 2025 forward and realise our vision that ‘no child in India shall be deprived of education due to hunger’, we need your inestimable support. Donate now to support ‘food for education’!